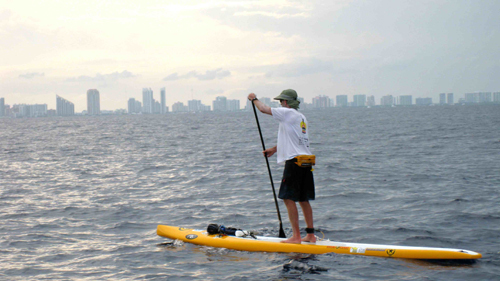 MIAMI BEACH, FL - Starting with a first paddle at the docks of the Bimini Big Game Club Resort & Marina to a final stroke landing just north of Haulover Beach in Miami Beach, Miami Watermen Bill Whiddon and Thaddeus Foote made history Saturday, June 9th, becoming the first to cross the Gulf Steam on stand-up paddleboards. 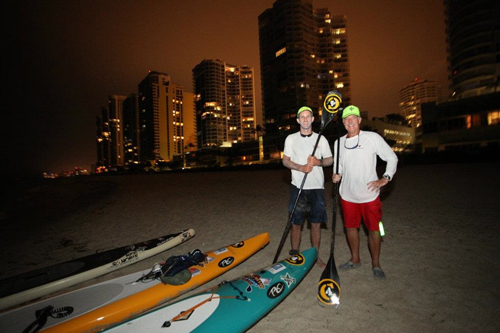 The pair, paddling to raise awareness for Surfrider Foundation¹s Rise Above Plastics campaign, battled rainsqualls, searing summer heat and the natural northern drift of the Gulf Stream, to complete the 60-plus mile epic journey in 17 hours, 11 minutes and 43 seconds from the first stroke to the last. 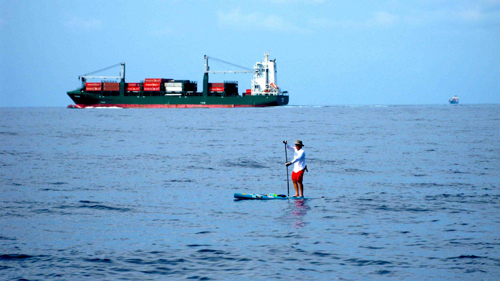 "It was paddle, hydrate, eat and paddle more," said the 58-year-old Whiddon. "We did battle a 40 minute tough squall with the first hour of leaving the Bahamas and the seas went from flat to three-foot swells breaking into us." 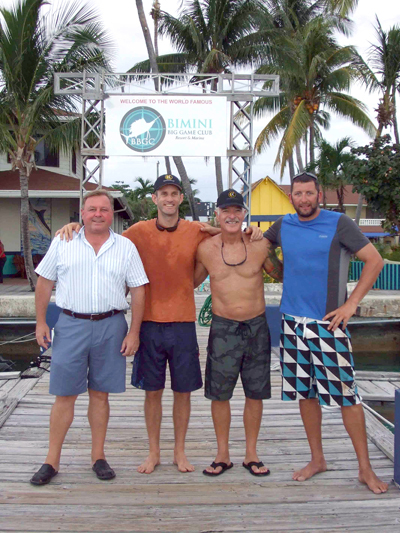 To counteract the north pull of the Gulf Stream, Whiddon said he and Foote, 38, started a heading more southwest out of Bimini and then after ten hours turned the course more to a due westerly direction that increased speed and pushed to the north. "We only had one fish encounter when we woke up a huge sun fish basking on the surface," Whiddon recalled. "The fins on the fish were at least two feet long. We also had a school of dolphin swimming under our boards for a longtime, using the shade for some relief from the blistering sun." "This crossing was a great opportunity to highlight the impact that plastics are having on our world¹s ocean and how our actions, as a society, can make such a big difference," said Foote. C4 Waterman, www.c4waterman.com , a Hawaii-based adventure sports equipment company supported the crossing by supplying the paddlers with the innovative X-Wing Paddle. C4 is also dressing the paddlers from head-to-toe in their new line of performance apparel. 145 feet in length. For more information, go to www.biggameclubbimini.com.